Before Google made a series of product announcements at its annual developer event, its CEO took a moment to deliver a message that would have been jarring to attendees just a couple years ago: Don't be overly idealistic about tech. "It's clear technology can be a positive force, but it's equally clear that we can't just be wide-eyed about the innovations technology creates," Sundar Pichai said during his keynote at Google (GOOGL) I/O on Tuesday. "There are very real and important questions being raised about the impact of these advances and the role they will play in our lives." Pichai's somber opening remark stood out at what was once an exuberant event, where you might see one of Google's founders do a skydiving demonstration of Google's smartglasses. Call it the new normal for Silicon Valley. The CEOs of Facebook (FB), Microsoft (MSFT) and Google all took time during their developer conferences this month to stress the need to think through the negative impacts of their technologies and to prove that they can still be forces for good, despite mounting scrutiny. The choice word for each CEO was "responsibility." Pichai said Google is now "even more reflective of our responsibilities." Satya Nadella, Microsoft's CEO, said Monday the company has "the responsibility to ensure that these technologies are empowering everyone." And Facebook CEO Mark Zuckerberg repeated a line used throughout his testimony before Congress last month. 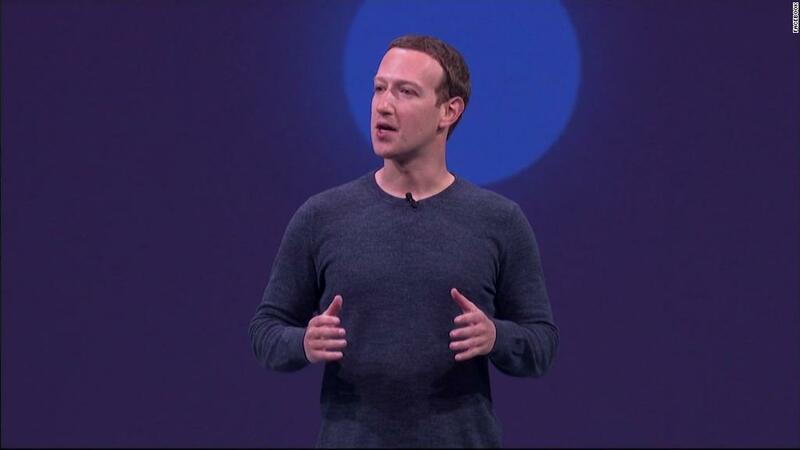 "What I've learned this year is we need to take a broader view of our responsibility," Zuckerberg said at the F8 conference last week. "It's not enough to just build powerful tools. We need to make sure they are used for good — and we will." The shift in messaging comes after Facebook's Cambridge Analytica scandal sparked a data privacy awakening among consumers and prompted a political outcry on both sides of the Atlantic. But that crisis also followed more than a year of bruising headlines about fake news, foreign election meddling and filter bubbles. "It's a good sign when these companies realize they have to be more accountable, not just to themselves, but they also have to be responsible to society in a way they maybe haven't thought of before," said Paul Argenti, a professor of corporate communication at the Tuck School of Business at Dartmouth. "The real proof will be in what they actually do -- not in what they say," Argenti added. At the events this past week, the tech companies touted a range of products and initiatives intended to boost user privacy, bolster the media and enact safeguards for artificial intelligence projects with what Nadella called an in-house "ethics board." Google also touted plans to improve our "digital well-being" by prompting users to take breaks and build a healthier relationship with technology. Dex Torricke-Barton, a former speechwriter for top executives at Google and Facebook, says the big tech companies have always emphasized their commitment to "creating a positive social impact," but usually in much broader terms. "What you're seeing now is a greater focus on communicating about the things people are most concerned about in their day to day interactions with tech services," he said. However, neither Google nor Facebook is fundamentally changing its core business yet: capturing our attention, collecting our data and using it to sell advertising. If anything, the events this month serve as a reminder that tech companies are only looking to burrow deeper into our lives. Facebook now wants you to use it for online dating and Google wants you to use its AI-powered personal assistant to make restaurant reservations and book hair salon appointments. If the old mantra of Silicon Valley was Facebook's "move fast and break things," the new motto may be: Move fast, but take reasonable precautions.